Most people’s idea of a windfall is likely to be something monetary in nature; winning the lottery, finding a fat wad of cash or discovering that the second-hand piece of art you rather dislike is actually worth a ridiculous fortune. But taken in a more literal sense windfalls arose from nature rather than commerce: a bounty of fruit blown from a tree by the wind to be received by grateful creatures below. 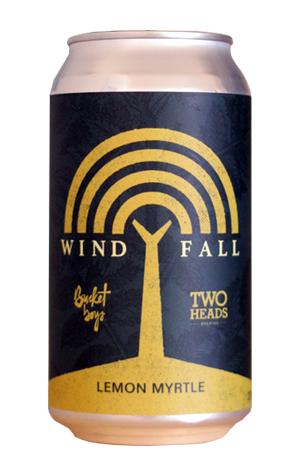 That foraging-type aspect is the inspiration behind Windfall, a series of collaborative beers between Bucket Boys and Two Heads Brewing. It’s centred around the idea of sourcing seasonal ingredients growing near the Bathurst brewery and adding them to a similar sort of base beer. The first one, for example, utilised a bumper crop of feijoas whereas this second release leans on lemon myrtle. Officially it’s a beer without style (note the can simply says “Lemon Myrtle”) but unofficially it sits somewhere in the realm of saison or table beer. It’s a very gentle and inherently simple beer where fresh lemon aromas allow for some mild yeasty characters to come through before you taste citrus zest on the palate and are left with a pleasant and refreshing dryness. At just 3.4 percent ABV this Windfall is light, breezy and easy for these 30 degrees-y autumn days.